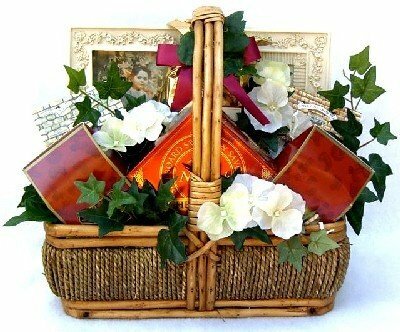 Our deluxe "in sympathy" gift basket offers a larger version of this popular wood and sea grass basket filled with: the featured item in this special gift is a beautiful ceramic frame to keep a cherished photo of their lost loved one. It's made of handcrafted milestones faux stone and has beautiful detailing, arrives gift boxed with a heartwarming poem, and it features the words "God sees every tear. No heart breaks alone". It's stunning. Earl gray tea in a unique cottage shaped box apple cinnamon tea, also in a cottage shaped box jumbo cashews Jordan almonds creamy dark chocolate filled butter wafer cookies spring onion crackers gourmet cheese spread "bon appetite" gourmet snack mix a large collectors tin filled with assorted Danish butter cookies a much larger box of assorted gourmet crackers gourmet caramel corn cinnamon sugar butter wafer cookies apple cinnamon cookies white chocolate macadamia nut cookies raspberry chocolate cookies after carefully hand packing the items inside, this sympathy gift basket gets adorned with silk ivy, flowers and a hand made designer bow. Just the sight of this beautifully arranged sympathy basket may go a long way towards lifting their spirits.